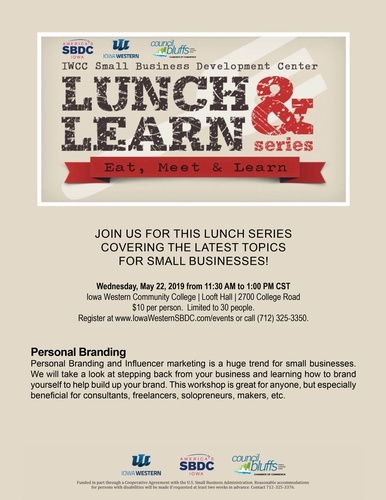 Join us for this Lunch & Learn Series covering the latest topcs for small businesses! Personal Branding and Influencer marketing is a huge trend for small businesses. We will take a look at stepping back from your business and learning how to brand yourself to help build up your brand. This workshop is great for anyone, but especially beneficial for consultants, freelancers, solopreneurs, makers, etc. Limited to 30 people. Register online at www.IowaWesternSBDC.com/events or call (712) 325-3350.